The Brandywine River Museum of Art. Visitors will enjoy a feast of decorative and visual art along with unparalleled examples of 17th-, 18th-, and 19th-century antiques at the Brandywine River Museum of Art Antiques Show on Memorial Day weekend, May 23-25. Visitors can purchase fine antiques, from furniture and rugs to porcelain, needlework and more from 30 distinguished dealers, and see Wyeth and American art on view in the galleries, including the special exhibition, "Horace Pippin: The Way I See It." This year, for the first time, the dealers will be located in the museum's atrium, as well as in the courtyard and lecture room. Thirty dealers, who travel from as far away as Florida, Michigan and Maine, will showcase American country and formal furniture, folk art, glass, quilts, clock cases, accessories and more. Proceeds from the Antiques Show benefit the Museum Volunteers' Art Purchase Fund, and Art and Education Programming. This year's featured exhibition is "Plus Ultra: Moravian Tiles of the New World." During the age of exploration the motto Plus Ultra reflected the belief that there was "more beyond" the known world. Henry Chapman Mercer (1856-1930), founded the Arts and Crafts style Moravian Pottery and Tile Works in Doylestown, Pennsylvania in 1898. First produced in 1912, Mercer designed an epic relief tile cycle on the theme of the New World. Mercer continued to add to the series over the years, expanding it to more than 70 tiles. This exhibition features 25 of the original tile designs of the New World series, commissioned for a gracious home in Pennsylvania, where they remained for nearly 70 years. This exhibition marks the first reinstallation of these tiles, which will be displayed as continuous frieze as they were originally intended. Tickets can be purchased online at brandywinemuseum.org, or by calling 610-388-8317. 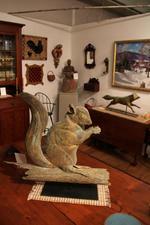 Preview Party - Friday, May 22, 6 to 9 p.m. Enjoy passed hors d'oeuvres, a smoked seafood and shrimp bar, multiple carving stations, a sushi display, along with many other culinary creations and delectable desserts. Tickets include valet parking, open bar and abundant hors d'oeuvres. Breakfast and Lecture - Saturday, May 23, 9-10:30 a.m. Discover more about the Plus Ultra: Moravian Tiles of the New World exhibition from Amanda C. Burdan, associate curator and curator of the exhibition. The event begins with a continental breakfast in the Museum cafe at 9 a.m. Space is limited, and reservations are required. Learn from the experts in these talks, which take place on the Show floor. Lecture topics include miniature portraits and silhouettes; 18th- and 19th-century militaria; acceptable restoration ofAmerican furniture; and American folk art; yellowware; oriental rugs; and trade secrets of the antiques business. Show admission: $18 per day. A three-day pass is available for $45. The show is open daily from 9:30 a.m. to 5 p.m. The Brandywine River Museum of Art is located on U.S. Route 1 in Chadds Ford, Pennsylvania. For further information, please call 610.388.2700 or visit brandywinemuseum.org.